Rob Honeycutt’s success defies so many conventions within the entrepreneurial canon that it’s hard to pick which part of his tale merits telling first. As a salesman, he’s not supposed to be good with software. As somebody without a college degree, he’s not supposed to be able to, in a little over a decade, start and scale up a complicated set of businesses all under one holding company. As a company based in South Carolina, Honeycutt’s firm isn’t supposed to be able to recruit globally and draw engineering talent to what is, for tech, something of a desert, although it’s improving. But Honeycutt has done all of that as the CEO of a nimble and growing manufacturing empire enabled by proprietary software that allows his salespeople to function as in-field engineers. Honeycutt’s holding company, SixAxis, in Andrews, S.C., includes ten companies that mostly involve the design, manufacture and distribution of industrial safety steps, platforms and cages. SixAxis also includes a full-on marketing agency, Red 7, that employs 20, and a 60-engineer software shop, Atlatl, that may hold the largest potential of any of the companies. 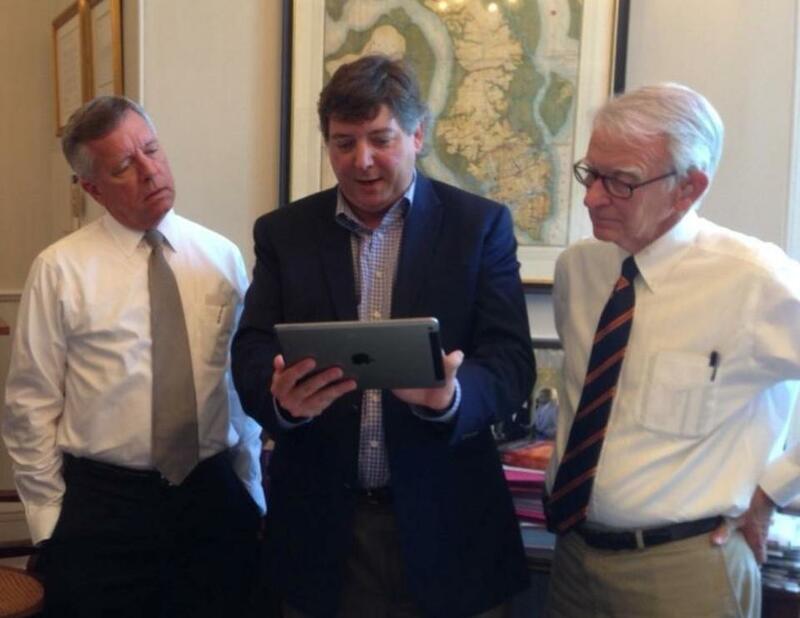 Rob Honeycutt shows off his new product to Joseph P. Riley, right, the mayor of Charleston, SC. Honeycutt, 44, had no thoughts of holding companies, computer code or digital marketing in 2001, when he quit his job after his employer made deep cuts in its sales budget and commissions. He had been selling metal safety fences that mounted to catwalks and platforms placed in factories and other industrial settings. He had no fallback plan. So Honeycutt and another salesman who left at the same time, Fred Harmon, decided to keep selling the same kinds of equipment as did their former company. They put together a catalogue of product—none of which yet existed—and took it on the road. They figured when they got enough orders, they’d find out how to get the stuff built. Early on, there was little need to worry about manufacturing. Today, Harmon and Honeycutt each own 50% of SixAxis, which doesn’t report revenues, but, based on my own estimates that aren’t disputed by Honeycutt, has an estimated $100 million in revenue. What we know: six years ago, SixAxis did $25.1 million in sales, and has enjoyed “double-digit growth” since. People with knowledge of the company estimate that growth rate to be near 25%, which, compounded, would put the company near $100 million in sales. In the first year of the business, however, the founders were far away from even $100,000 in sales, as the men managed to sell only $20,000 worth of product their first year. For that, they found a contract fabricator to fashion what they needed. The second year, however, brought more sales—just under $1 million—and the realization that contracting out the manufacturing on an ad hoc basis wasn’t a good solution. The welds were sloppy and the equipment, though it worked, wasn’t good enough to sell in bigger quantities. So Honeycutt leased the cheapest manufacturing building he could find—it had a dirt floor—and slowly started hiring tradesmen to weld, cut and bend steel into the products he sold. Many of the installations of Honeycutt’s equipment—metal stairs and platforms to straddle an oil pipeline, or a trestle built over train tracks to give workers safe access to tank cars–require a good amount of custom design. The process, similar to much of the industrial manufacturing world, worked like this: A client specifies the kind of apparatus they need and a salesperson takes notes and makes recommendations. A rough plan of the solution is then passed off to an engineer, who designs a solution with structural integrity and safety factors built in—a process that typically took two weeks. Those specs in hand, the job could then be priced and the potential customer served a quote. The customer often makes modification requests, of course, which forces this process to restart from the beginning. As Honeycutt’s business grew, he added engineers and salespeople accordingly. These people were needed to grow the business. But in the factory, Honeycutt faced a shortage of skilled tradesmen, like welders, in his section of rural South Carolina. The solution: robots. As soon as the company could land a bank loan, it began upgrading its manufacturing with German-made machines that could do the work of men. On the front end of his operation, the selling side, Honeycutt’s stabs at increasing productivity weren’t as successful. The company had run through a number of CRM software packages, including Salesforce and Microsoft Dynamics, but none of them helped produce quotes or push forward the production process, the real crux of Honeycutt’s customer funnel. Then in 2010, Apple unveiled the iPad. Honeycutt saw the device and had an immediate inspiration that would later change his company’s growth from steady to rocket-like. The iPad was a machine built for salespeople, he thought. Long before there existed a profusion of applications built specifically for the iPad, Honeycutt put together a small development team and built software that would allow his sales people to show off his products via the tablet computer. The iPad interface used by sales people at SixAxis. The coding manifested in a program called Quotebooks, which combined proposal writing with CRM functionality. As the development team continued to build out the software, Honeycutt pushed more and more of the sales process into the tablet. He wanted to eliminate the time lags, the paperwork and the hassle that the customer, his salespeople and his engineers had to endure when executing a successful sale from beginning to end. He wanted to take a process that once took weeks down to days or, his ultimate ambition, doing away with the delays altogether. Honeycutt wanted his sales team to be able to sit with a client and use the iPad’s screen to build the exact apparatus needed. The software, he reasoned, should only allow the user to build structures that were sound and within safety standards. Then, with a touch of a button, the design could get relayed to Quotebooks and a price produced. The client would have all the information she needed—construct, materials, and price—right in front of her during the first meeting. To realize this vision, Honeycutt’s engineering team narrowed the number of standard parts used in building its safety structures to only 20. This way, the software could more easily piece together the most efficient solutions and the factory could be further automated, largely eliminating custom welds and cuts. To replace the engineering end of the process—to ensure that the software only created solutions that were structurally sound, legal and safe—Honeycutt’s developers composed thousands of algorithms that calculate stresses and strains on steel members and alter the design as necessary. For instance, as a salesperson expands a horizontal platform farther and farther, the software automatically builds in extra trusses and support beams as needed. Coordinating with the engineers and fabricators, it took the software team two years to build out a tool that effectively turned salespeople into engineers. The result has multiplied SixAxis’ sales 500% during the last five years. The software is on its third major iteration now. Direct labor once comprised 38% of the costs in selling and creating Honeycutt’s product, but his custom application has dropped that number to 7%. SixAxis’ top salespeople used to account for $2 million to $3 million of sales per year; now that number is $8 million to $10 million. “And it’s the same exact people,” Honeycutt says. Automation, of course, can often eliminate human jobs. In Honeycutt’s case, however, his company has grown so quickly with the new sales tools that he’s added 35 salespeople since 2010, while keeping the quoting department the same size—about 1.5 full time positions. Twenty of those new sales jobs have been added in the last 24 months, and it can take nearly two years for salespeople to become fully productive, Honeycutt says. The company plans to add an additional six sales positions in April. The success of his software foray convinced Honeycutt to make a product out of it. Three years ago, SixAxis moved most of its 15 developers into a new company, Atlatl, that would create a customizable SaaS platform for selling all kind of technical industrial systems. Atlatl now boasts 60 developers, most of them in Charleston, SC, the closest spot to Andrews where Honeycutt felt he could reasonably recruit tech workers. SixAxis’ base business of building custom metal structures continues to thrive—its clients now include Boeing, SpaceX, NASA, Exxon, Tesla, Toyota and John Deere. Atlatl remains what Honeycutt refers to as “my money-losing software company,” but it could one day surpass the rest of the business. 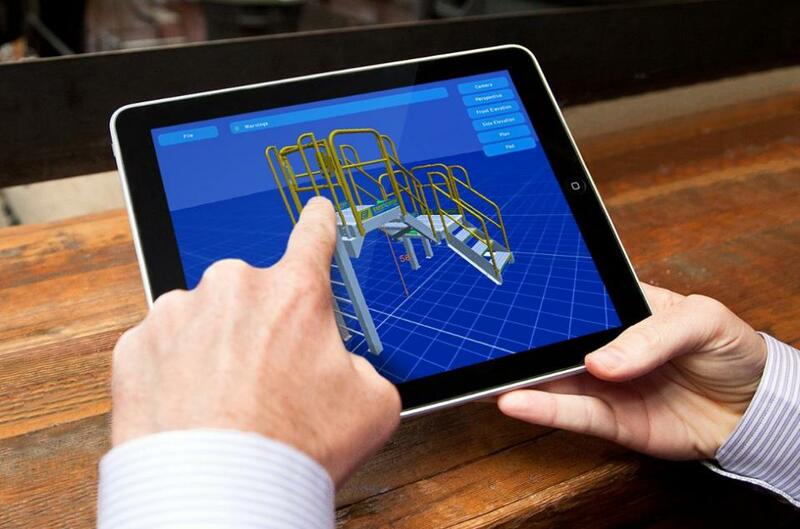 The software arm has built platforms for all manners of companies who sell customizable physical systems, from cabinet makers, crane manufacturers, fence fabricators and warehouse designers. The initial build costs clients anywhere from $200,000 to $700,000 and they then pay a per-seat SaaS fee of a few hundred dollars per month. The software is built around a touch-screen user interface, which allows salespeople to easily manipulate a floor plan, schematic or whatever it is they may be trying to get people to buy. “It kind of becomes a video game—and that means salespeople will actually use it,” says Honeycutt, in a not-so-veiled reference to himself. Christopher Steiner is the New York Times Bestselling Author of Automate This, How Algorithms Took Over Our Markets, Our Jobs, and the World. Follow him on Twitter.